No one said being a Power Ranger would be easy, but the Mighty Morphin Power Rangers didn’t expect Rita Repulsa to kidnap one of their own before the Homecoming Dance! Jason, Kimberly, Zack, Trini, and Billy are well on their way to finding their place as the Mighty Morphin Power Rangers. Juggling school, superhero extracurriculars, and budding romance--our favorite teen he No one said being a Power Ranger would be easy, but the Mighty Morphin Power Rangers didn’t expect Rita Repulsa to kidnap one of their own before the Homecoming Dance! Jason, Kimberly, Zack, Trini, and Billy are well on their way to finding their place as the Mighty Morphin Power Rangers. Juggling school, superhero extracurriculars, and budding romance--our favorite teen heroes have it all under control. But when one of them has the opportunity of a lifetime that might lead to leaving the team, the dastardly Rita Repulsa kidnaps a Ranger to use the deadliest weapon known to teens: high school drama. 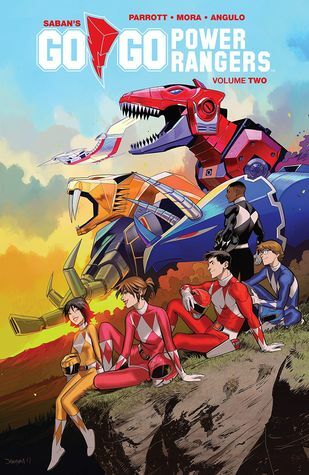 Join writer Ryan Parrott (Star Trek: Manifest Destiny) and Russ Manning Award -winning illustrator Dan Mora (Klaus) in the next morphinominal installment of Saban’s Go Go Power Rangers.